UPDATE: There’s a new and much more detailed version of this article here. This is still a good quick overview, but the details are better here. You can’t throw a rock without hitting a tutorial on etching your own PCBs. They’re everywhere, and there seem to be as many techniques as there are hackers. So why am I bothering to write another one? Well, there wasn’t any single procedure that met all my goals, so I decided to synthesize a process from everyone else’s ideas. This is what I came up with. Tidy. I don’t want to invest in bulky equipment like laminators or laser printers. Precise. I want to be able to use small traces, and make compact boards. Here’s a sample of the finished product. Those are 0.01″ traces, and they all worked on the first try. This technique is great for small boards and complex layouts. Excuse the mess on the three large pads at the bottom. More on that later. The first step is to make a board layout. You can’t do much better than Eagle, although the learning curve can be a bit steep. The SparkFun tutorials are a really good place to start. After that, read the manuals that come with the software. Here's my board, in Eagle. Note that I tell the autorouter to use 0.01" traces on a 0.05" grid, which is contrary to what many tutorials for hobbyists say. 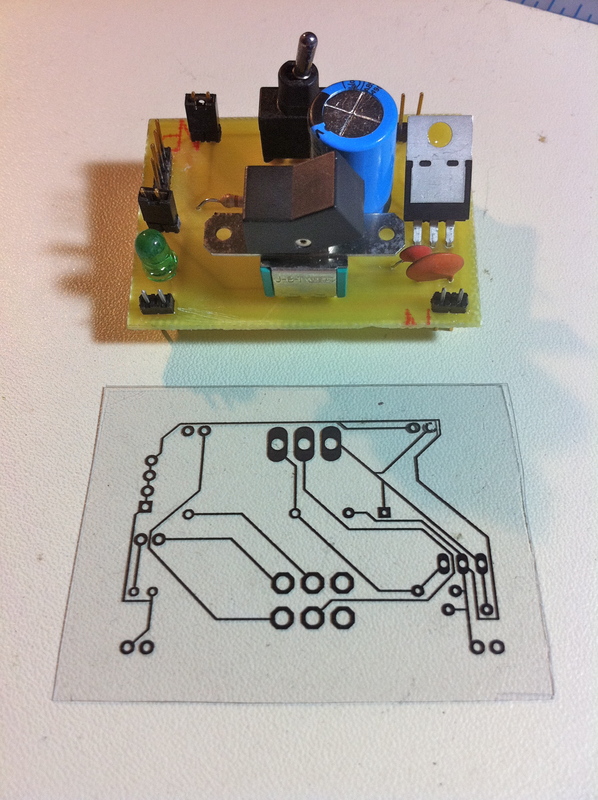 This etching technique works well on traces that small, and you can make a much more complex board without resorting to dual layers or lots of jumpers. A layout grid that is double the resolution of the component grid solves a lot of routing problems, in my experience. I hide all layers in Eagle except the bottom traces, then print it to a PDF. This works great because it's very high pixel density. That's critical to getting small traces to work. Many tutorials will tell you to use the Image Export operation, but that generates pixelated images that mess up small traces. Next, I bring that PDF to FedEx Office (formerly Kinko's), and print it on regular paper. I then photocopy it to overhead transparency. Kinko's self-serve printers will not let you print to acetate, but they will let you photocopy onto it. The self-serve printers are a tenth of the cost of going up to the counter, so this two-step method is well worth it. Why not print it at home? Printers are bulky, ink is ridiculously overpriced, and Kinko's self-serve is 10 cents a sheet. That's a lot of PCBs for the cost of owning a printer. If any part of the printout isn’t totally opaque, use a Sharpie to cover it up. I got a bit sloppy with mine while touching up the three large pads. You can see the result of that in the final product. Next, I use the photoresist method to transfer the pattern to the board. This tutorial from Jameco explains it far better than I could. Plus, Collin Cunningham is hilarious. You only need to watch up to the 4:10 mark. After that, his process is different than what I’m describing. You’ll need Positive Developer, as well. This is the one and only unpleasant chemical involved. As much as I like Jameco, this stuff from Mouser is 10x cheaper and works just as well. 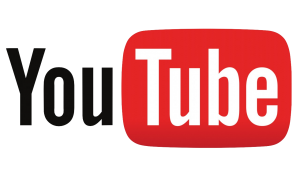 As shown in the video above, I apply the acetate to a presensitized PCB. These are almost as cheap as regular copper board, and extremely easy to work with. You can expose them with a regular lamp and an old picture frame. It takes only minutes, and because it's a photographic process, it's exceptionally precise. Far more so than the song & dance people do with laser printer toner, magazine paper, a clothes iron, and water soaking. I expose the board for twenty minutes with the lamp about as close as I can get it. Once the board is exposed, sloshing it in a solution of 10 parts warm water and 1 part Developer reveals the pattern in all its glory. This takes under a minute. Now we’re ready for the real work- the etching. For this portion, I can’t give enough thanks to Stephen Hobley and his etching process. I’ll embed his video here, but I strongly recommend reading his site, where he goes into detail on what this is and why it works. 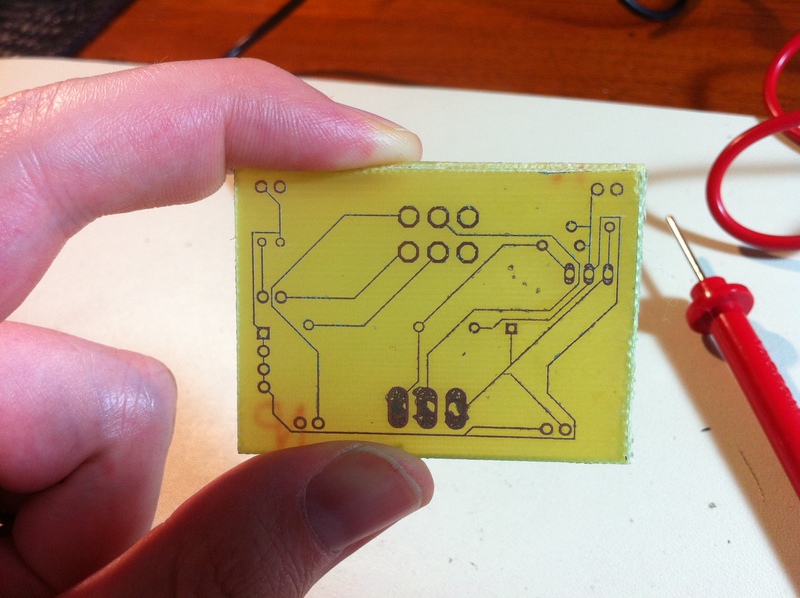 Yes, you can etch a PCB with nothing more than hydrogen peroxide, vinegar, and salt! This mix is so benign you could almost eat it. Please do not eat it. If you do eat it, please do not tell the judge I told you to eat it. Your Honor, if you’re reading this, I explicitly told people not to eat it. Off we go! With Stephen Hobley's mixture of 1 part peroxide to 1 part vinegar, the board is etching happily (in the substance that we didn't eat, right?). As Stephen explains, dump some salt in there to start, and as needed to keep the bubbles going. Also, open a window, because it smells a bit funky. If this nearly-edible PCB mixing method seems too good to be true, well, there is a catch. It's slow. The board will require about an hour of soaking, with occasional sloshing and adding salt. Sure, the ferric chloride or muriatic acid methods are faster, but those chemicals are nasty and expensive. 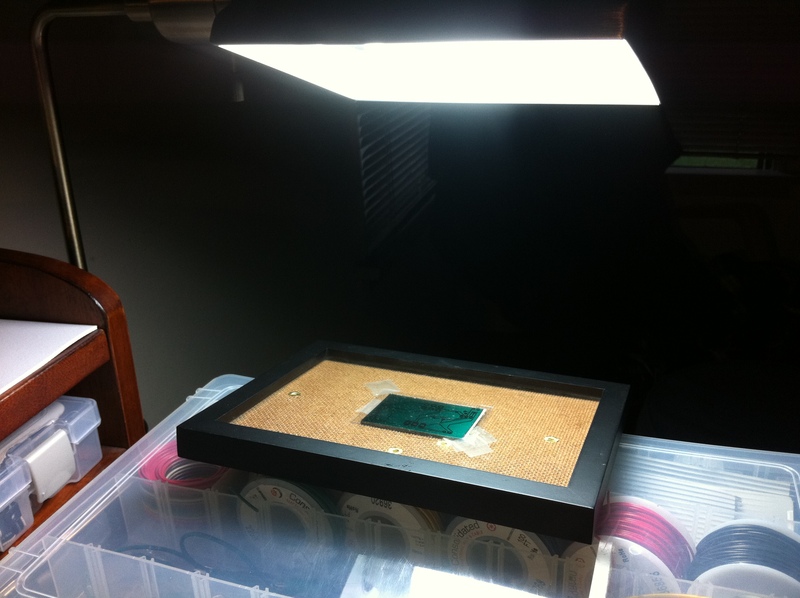 With this method, you can etch a PCB on your kitchen counter, with stuff you probably already have in your cupboard. As slow as this is, it's sure faster and cheaper than sending away to a PCB house. Once all the unwanted copper is gone, a quick wipe with nail polish remover and cotton balls will clean it up and get it ready to drill! Isn't it purrrty? To drill the normal component lead holes, I use a #69 (.0292" or 0.75mm) bit in a Dremel. Use larger bits as needed for switch terminals, etc. In my experience, you really don't need a drill press like everyone says. Just hold the board by the edge with one hand (wear gloves), and drill with the Dremel in the other hand. Wear eye protection and a paper mask! Fiberglass dust is nasty. Here you can see the "damage" caused by my sloppy Sharpie work on the three large pads at the bottom. Well, better too much copper than too little! I'll be more careful next time. One other tip- for holes larger than #69, drill a pilot hole with the #69 first. Starting with larger bits will make too much heat and melt the fiberglass. Wow! that works really well. i decimated a penny to test and after an hour, it was all zinc. Surprising, isn’t it? Makes etching PCBs much more pleasant. All that dissolved copper in solution after etching a board or two would make it something you probably shouldn’t be pouring down the drain. How would you go about reducing that copper out of solution so that its no longer so bad for drains? Would dropping aluminum scraps in there work similar to the salt + copper sulphate etch? (It pulls the copper out of solution and leaves it in pure metallic form). Wrong! Copper ions (the blue stuff floating in your juice) is poisonous to fish. But the quantities you can produce with a few boards is negligible. Your juice also won’t cause damage to pipes. It’s too weak. Also, take al ok at this page: http://www.exploratorium.edu/science_explorer/copper_caper.html , it offer a good explanation to what actually happens in your juice. It does not really explain what the peroxide does. It has to do with the floating CU2 that re-combines with the etched (clean) copper surface. This gets dissolved again. Try the experiment on that page. 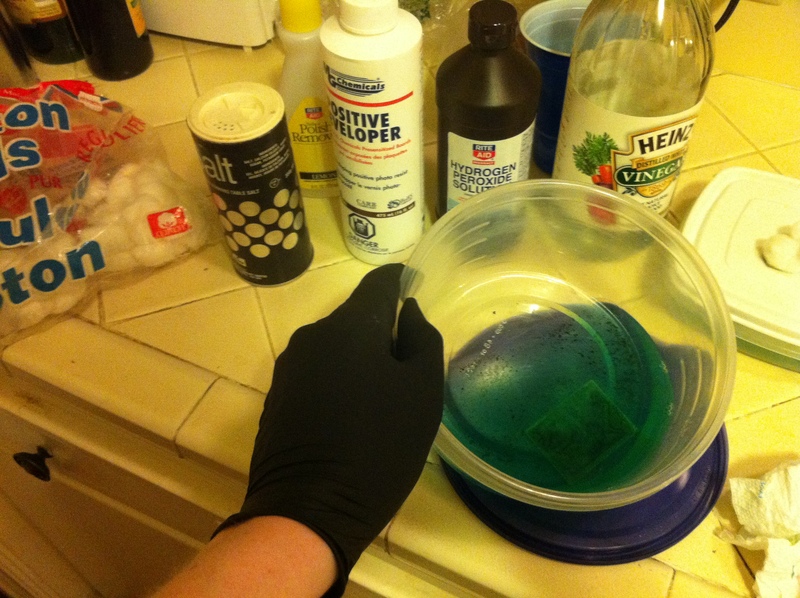 Then do it again, this adding 1/4 cup peroxide. See the difference? Then rinse everything and do it with salt and vinegar again. In this (and your) experiment, rinsing often makes a big difference in the time it takes. It has to do with removing the oxidized stuff and exposing raw copper. It also has to do with keeping a balance between salt, oxygen and chlorine. A bigger bath will give you more consistent, faster results. Salt, vinegar and peroxide are cheap! Use lots and rinse often! Dumping the copper waste down the drain actually has it’s good side. If you are on a septic system the copper waste will kill off any tree roots that have invaded your septic system thus preventing a major clog that would require a huge plumbing bill! (Home depot sells copper-sulfate for this purpose). I use the H2Os/muriatic acid solution myself. Muriatic acid is sold at your local pool/patio store and is used to adjust the PH of your swimming pool water. It is NOT expensive. However, due to the fumes and such I do my etching outside! The 2 to 1 mixture of H2O2 to HCL etches FAST and makes very clean lines. Do you have any suggestions for accurate drilling of those tiny little holes? I’ve found that if you set the interior radius of the pads in Eagle to be a bit smaller than your bit, the copper will act as a pilot and do a good job of centering the bit. Aside from that, I just take my time. 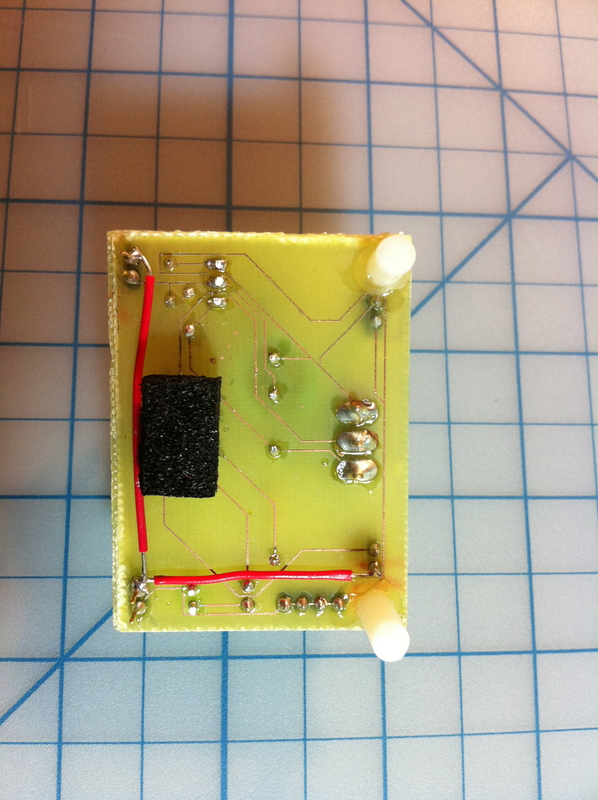 Sometimes I make mistakes and chop up a pad, but that can always be fixed with solder and/or jumpers. Oh, also, I have the pad restring radii in Eagle all set to 25%. This gives them a lot more copper area, so there’s more room for error with drilling. The downside is that the pads are so big you lose the ability run traces between them on .1″ spacing. This makes routing more difficult, and means a lot more jumpers. I think the tradeoff is worth it though. Er.. I meant 50%. Double the default value. I use a sharp pin and a hammer to create a small crater to ease drilling. I have tried that vinegar, peroxide and salt combo a few times now. I just can’t get it to etch! I can turn the copper green but I can’t etch it. I once left a small PCB scrap in solution for over a week and it barely thinned the copper! I know “i did it and it didn’t work” isn’t much to go on but it doesn’t seem like that complicated a process either. Any ideas? I’d love to switch etchant solution but for now I am stuck with Ferric Chloride. I’m sorry to hear it hasn’t worked for you! Let me see if I can help. First, let’s make sure you’re using the right ingredients. I’m using 3% hydrogen peroxide purchased at CVS (comes in a brown plastic bottle). The vinegar is distilled white vinegar from the grocery store (Heinz brand, though I doubt that matters). I mix them in a plastic container 50/50. Everything is room temperature. For a 3″ x 3″ PCB, I’m using 1/4 cup of each, making a total volume of 1/2 cup. I put roughly a teaspoon of salt in the mix, though that amount seems really flexible. You’ll know it’s working if the copper starts turning a yellowish brown after about 30 seconds. Once the copper turns brown, you can wipe it off to expose fresh copper and soak it some more. The brown stuff is actually a copper salt precipitate, if I understand this reaction correctly. If you don’t wipe it off periodically, etching takes much longer. I use a foam paint brush and wipe it every 60 seconds without removing it from the solution. The PCBs I’m using are pre-sensitized boards designed for positive photo developer. They were purchased from Jameco. Etching a 3″ x 3″ board this way takes about 20 minutes in fresh solution, with wiping. In old solution (vivid blue in color), or without wiping, it takes around an hour. Let me know if any of information helps! It’s also worth noting that this oxidizer + acid + copper reaction has other variants that might work for you. For example, muriatic acid (aka hydrochloric acid) is much more powerful, but of course must be handled much more carefully. It might be still be nicer than ferric chloride though, which is really nasty stuff. You can buy muriatic acid in pool supply stores or hardware stores. It’s often called “pH reducer” which is funny marketing speak for an acid. For friendliness, though, it’s hard to be vinegar for the acid. You could also try a stronger oxidizer, though higher-than-3% hydrogen peroxide gets expensive and hard to find really quick. Muriatic acid was going to be the next thing I try after my Ferric Chloride runs out if I couldn’t get it working with Vinegar and H2O2. Hey, thanks for the advice! I think my Hydrogen Peroxide was 3% too. I’ll check that. That is the same Vinegar I have tried. Maybe I just need to scrub the deposit off better? I’ll try the foam brush like you use. Hopefully I will get a chance to try this weekend. A gentle wiping of the brown gunk is all it takes. Honestly though, it works without doing that, it’s just a bit slower. If yours isn’t working at all, I suspect something else. What masking method are you using? I’ve only tried it with photoresist masking, not the toner-transfer method that a lot of people use. Perhaps the latter leaves some residue that the vinegar can’t breach. Another trick I’ve heard of is to wet a sponge with the etching solution and just keep rubbing the board with it. This is supposed to work faster than leaving the board sitting in the etchant solution, sloshing the stuff around or even using a bubble system. You’ll need to wear some gloves while doing this (latex or plastic like plumbers, health care workers, or food preparers use, or just some ‘playtex’ dish washing gloves). I like the idea to edge my boards at lowest cost. Unfortunaly since 9/11 in my country noncommercial users are not allowed to buy any ingredenzies capable of building weappons of mass destruction. You can only buy bleaching H2O2 (3%). What do you recommend as replacement for Hydrogen Peroxide? I use 3% H2O2 bought at the local drugstore (intended for hair bleaching or disinfecting injuries). It’s more than enough of an oxidizer to get the reaction going. Hello, Great stuff here. A question though. Do you think this would work for etching if I used a sharpie or paint pen as my resist? That’s a good question- I haven’t tried that. Give it a shot and let me know what you find out! At the very least, I’m sure you could use a sharpie to mask off areas to be left undeveloped on a photosensitive PCB. You’d have to work in a dark room under a red light though, so you don’t ruin the board while you’re drawing. Thanks for the reply! I plan on trying it this weekend. 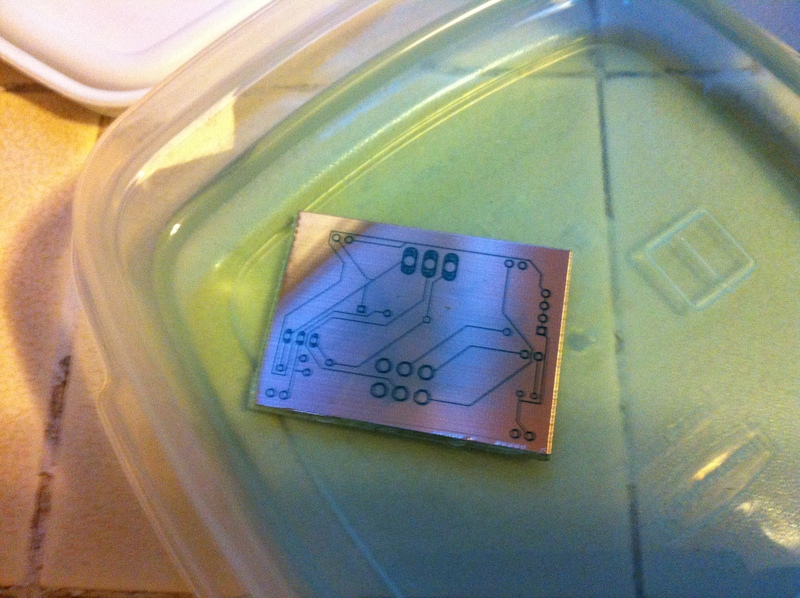 I plan on doing a few test runs of various etching solutions/resists (time and boss, ie, WIFE…permitting!). I certainly will keep you posted. Thanks again! Well, it went OK using the paint pen. Just a quick one-off board. Took some time though! And a few tries to get the mixture I wanted. But it DOES work. Cool! If you have any pictures, that would be interesting to see. Hi, I’ve etched a few boards at home, but I have always had mixed results (especially trying to get good artwork from laser printing onto transparencies), but have had really BAD results with the toner transfer method. I’ll have to give this way another go. One tip though – I always leave as much copper on the board as I can; either as fat Gnd/Vcc rails, or even just as unconnected islands of copper. The copper is better off on the board than in solution, and means the etchant can be re-used more times. This is awesome! Great tutorial. I agree about the superior photo-resist/developer technique. I used to make lots of boards that way when I was in high school in the electronics lab. Have been using 40 Volume Clear Developer (Water, Hydrogen Peroxide (15%), and Phosphoric Acid) and Oxi Clean (Sodium Percarbonate) mixed with Xanthan Gum and Glycerin to make Retr0Bright to de-yellow old equipment cases. I wonder if you, or anyone reading, would consider this source of H2O2 and Oxi Clean as a mix? I’m not a chemist, but am thinking the Phosphoric Acid might replace the vinegar and the Sodium Percarbonate the salt. Say, that’s pretty interesting! I didn’t know there was a substance that had H2O2 in a decent concentration and an acid as well. Just adding salt to the Clear Developer might be enough. I don’t know how phosphoric acid would react to the copper, but it’s worth a try. With such a high concentration of the oxidizer (H2O2), it might be a very effective reaction. The drugstore stuff I’m using (3%) works, but it’s a bit slow. It sure is cheap, though. A few dollars buys you gallons of vinegar and drugstore peroxide. A little quick googling seems to suggest that phosphoric acid doesn’t react with copper, although vinegar doesn’t really either until you add an oxidizer and a catalyst. This question is beyond my fuzzy memories of high-school chemistry, but that Clear Developer stuff is quite cheap, so it might be worth trying in a well-ventilated space. If there are any chemists in the audience, please chime in and enlighten us? If you have a License you can get the Developer another next step up; 50 Volume at Sally’s Beauty Supply. I get the 32oz 40 Volume for less than $5. Once the Oxi Clean is added, you must wear gloves to use the stuff around UV (Sun) light. Else you will feel its (sting) affects and be left with temporary white marks on your skin. The Oxi Clean also does not like to dissolve in a cool mix. Have found it best to add the Oxi Clean after fist dissolving it in 1 Tsp of hot (not boiling) water. About 1/4 Tsp of Oxi Clean with 1 pint of H2O2. I’ve used the same 1/4 Tsp with a mix as little as 1/2 cup of H2O2 for small jobs and it makes for a stronger (ouch) solution. Good tip, thanks! Dry developer is a good idea. Storing the liquid stuff is a bit of a hassle. Nice tutorial Girl!! Its good to see a few ladies here and there, in the engineering world. Neato combination of techniques, I especially like the picture frame trick, hah hah, very clever and a CFL, my house is full of them! I constructed a bunch of UV LEDs for my old exposer, but I don’t use it at all anymore or photo-etching. I ran across a German (scientist) website about ten years ago. Very sophisticated homebrew PCB fabricator, he’s the cat who discovered that one can print directly using CD-Rom inkjet printers (such as Epson R280), and cyan UV fadeless **PHOTO-INK** (water-proof), to print 5mil (that’s .005″) wide traces directly on clean copper PCB boards and then straight into the acid bath. In the past these type strategies did not work well, due to etch undercutting, but thats been solved by **FAST ETCHING**. It works great!! I do QFNs and MLFs (3mm x 3mm packages, no leads) using this method. I now do everything SMD. I also constructed an IR (using an InfraWave Black & Decker) toaster oven, to reflow my SMD PCBs, although a skillet works fairly well too, I hear. But that’s not the point of my post here, using the German fellow’s (I don’t recall his name or website), acid bath method, one can reduce the time the PCB is immersed in the etching solution to one or two minutes!!! Fast etching. How? While wearing rubber gloves, and eye-protection, by pouring the acid onto a soft sponge just evenly wetting it with the acid, –no tank or tub (except to catch drips) is required and then simply wiping the copper away in soft-touch, non-overlapping strokes. How kewl is that? If ya don’t wanna get that close & personal with the acid, another fellow, takes two plastic zip-lock bags, one inside the other (for possible leaks), breaks the edges of the PCB (sandpaper, etc) pours about 1/2 oz of etch solution (whether persulfate, ferric chloride, or muriatic+peroxide, etc) into the inner bag along with the PCB, zip it all closed, and then squeegee using a soft rubber ‘bray’ roller to squeeze the etching solution out over the board, a couple of times. Unzip, yank the PCB out, rezip the bags, save them for later usage (about five uses) rinse the PCB, tin-plate it, drill it, use it. I’ve used the sponge method with ferric chloride and with the hyper-fast etching solution of ferric chloride and a bit of citric acid (called the ‘Edinburg Etch’, gaagle it, its all over the ‘Net, also, there’s the trick of mixing the used solution with calcium carbonate, which reverts the acid into a much more eco freindly form). However, this weekend I’m going to try mixing up the vinegar+hydrogen-peroxide+salt method, just to see how things work. I’ve thrown out my bubble tank, and my homebrew rocker tub, and a sponge with about 1/2 oz of etchant, which takes all of about two minutes. Thanks for sharing your techiques. I’m a newbie; how do you tin plate the boards? Honestly, I don’t bother. However, if you want to plate all the copper after etching, I’ve seen people do it by simply running solder over everything, much like you would tin a wire. 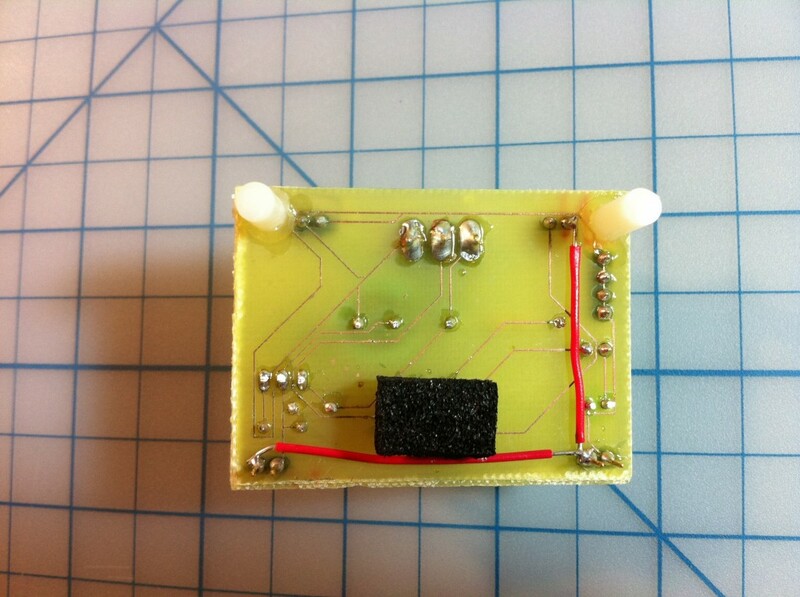 Heat the traces with a soldering iron, and flow solder on to them. I hate making the PCB’s with conventional techniques. We have ipads and pods and amazing technology knobs, but still we use 100 years old methods for making PCB??? Should be different! 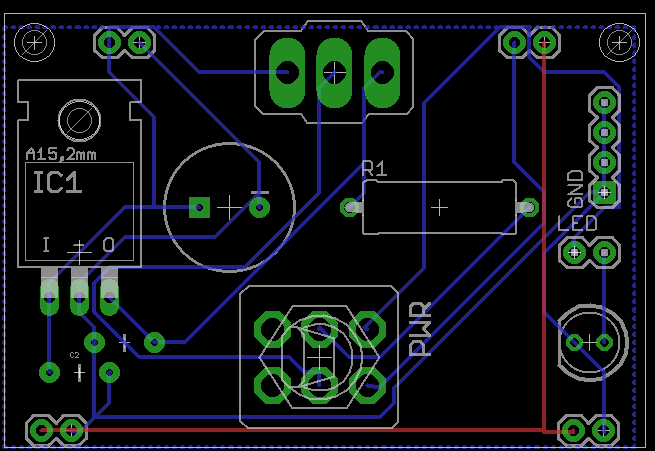 I won’t make PCB:s myself until there comes something better and safer ways for production. Maybe with 3D-printers revolution could innovate something? These methods of making PCBs only date back to around the 1960s, actually. Fifty years goes by faster than you might think. Give these methods a try- it’s really quite easy considering the level of precision you get. The act of creating something like this with your own two hands is also very rewarding. If you prefer not to do it yourself, then you can point and click your way to a board fab house as well. It costs a lot more and takes a lot longer, but it’s certainly “easier” I suppose. If you’ve got an electric eraser (as used in drafting. Mars-Staedler, Bruning, — full-sized, not mini) and can get an Xacto double-ended pin vise, you can put together a more comfy and fit-to-function hand drill for pc boards. Remove the collet from one end of the pin vise and screw it into the nose of the electric eraser (after removing any eraser stock). Put your fine (#69? #65 is my go-to) bit into the still-colleted end of the pin vise and tighten it up. You now have a pc board drill that’s low enough in torque not to develop a mind of its own as to where the holes should be (unlike Dremel etc). It’s thus less likely to skitter away and snap bits. If the bit jams, just counter-rotate to unscrew it from the hole, clean the debris from the hole-thus-far, then come at the hole again, slower, letting the drill do the muscle-work without you leaning into it. That applies whether you’re drilling out a just-etched board or making some kluge space in one corner of an existing board (use a clamped-on piece of perfboard as a guide if you want 0.1″ centers). Oh, and it’s likely lighter than the Dremel, too, which matters in not having muscle fatigue cause you to mess up drilling a board full of holes. I’ve been doing this for decades, now, and, after using Dremel, Fordham, Iso-Tip drill extension and various other drill-type tools, I keep coming back to my Bruning. It just *thought* it could retire when I went from the drafting table to OrCAD. I’ve been using the hydrochloric and H2O2 method with positive developed boards, and found that it etches right thru the mask and scores the copper underneath. Not enough to ruin the board but enough to make it ugly! (I leave the board in the juice JUST until the waste copper is gone, so I don’t over-etch; yeah, right.) Plus the stuff is hard to store and has a terrible shelf life. I gave up on that juice and have been using ferric chloride again (at least I can make a GREAT board that way; my traces are really narrow.) I’m trying your vinegar method this weekend. I use Tinnit to tin-plate my boards after. That’s interesting- I haven’t heard that perspective on the H2O2 version of this process. One of the nice things about using vinegar is that, as such a weak acid, the etch time is very forgiving. I don’t think I’ve ever undercut or damaged a trace. Of course, the downside is that it’s slower to etch. However, I think the tradeoffs of safety, convenience, and cost are well worth a little extra time watching it bubble. I Want To Ask You That Can I Use This Etching Solution Without Perioxide or Any Alternative Of Perioxide. Please Give Some Altertive Names If Available. The solution needs at least an acid and an oxidizer. The peroxide could probably be replaced with a different oxidizer, but I don’t know off hand what any others are.